At high frequencies, power is the best measure of signal amplitude because, unlike voltage and current, power remains constant along a lossless transmission line. Power measurement accuracy is dependant on several factors: standing wave ratio (SWR); mismatch uncertainty; instrumentation uncertainty; calibration factor uncertainty; noise; zero drift; and for digital measurements, plus and minus one count ambiguity. Of these, by far the largest source of uncertainty is SWR mismatch. Further information is available in various HP Application Notes and Bench Briefs. Power can be measured in various units including Watts and Decibels. A RF Power & Voltage Conversion Chart is available providing conversion from power in dBm (+99dBm to -99dBm) giving power in Watts and voltage in Volts rms, dBv, dBmV & dBµV. I have 4 different Power Meters available: digital; mixed analogue & digital; and analogue. The HP 438A is a digital Power Meter with µP controlled dual channel inputs. Choice of display in dBm, dB relative, Watts and % relative. The measured ratio and difference of 2 inputs can be displayed. The ratio or difference power readings of a single sensor input can also be displayed. Manual or automatic ranging, zeroing, calibration, offsets, and panel settings memory are available. 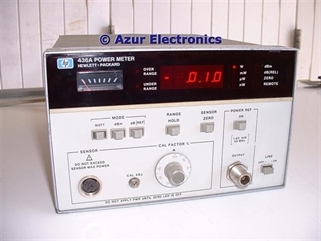 For details see HP 438A Power Meter. The HP 436A is a digital Power Meter with an analogue meter as well which shows fast changes in power levels to assist in ‘peaking’. Choice of display in Watts, dBm or dB. Auto ranging, automatic sensor recognition and auto zero features. 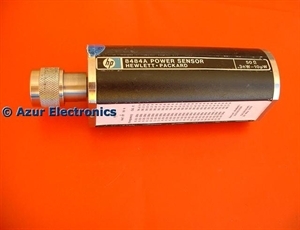 For details see HP 436A Power Meter. 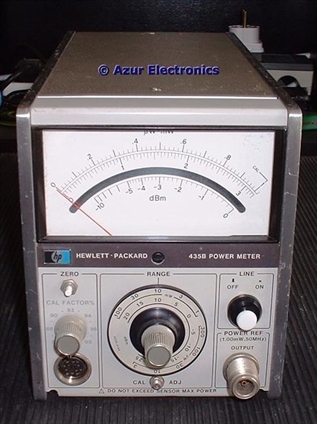 The HP 435B is an analogue Power Meter. It has internal automatic zeroing and a calibration factor adjustment. It has a power range of 55dB with 10 full-scale ranges of: 3, 10, 30, 100 and 300µW; and 1, 3, 10, 30 and 100mW. It is also calibrated in dB from -25dBm to +20dBm full-scale in 5dB steps. 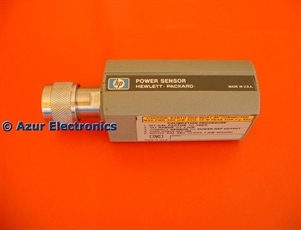 For details see HP 435B Power Meter. 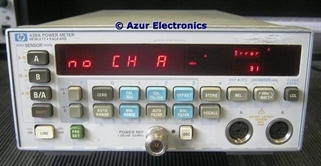 The HP 8901B is a digital Power Meter with µP control. 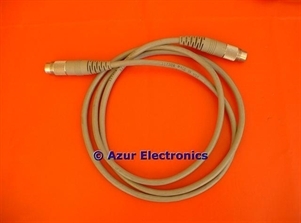 It can be used with any of the HP 8480 series Power Sensors or the HP 11722A Sensor Module (Wanted To Buy) which measures from 10µW -20dBm to 1W +30dBm at frequencies from 100kHz to 2.6GHz. For details see HP 8901B Modulation Analyser. NOTE: The power range depends on the power sensor being used. The Power Meters need power sensors which are connected via special cables. There are 3 types of power sensors: diode; thermocouple; and thermistor. Diode sensors are best. These use a low-barrier schottky diode to achieve 100pW -70dBm sensitivity with low noise and drift. They operate in the square law region so can be used to measure the true power of complex as well as CW (Continuous Wave) waveforms. NOTE: 8481A Maximum Input Power 300mW average or 15W peak for 2µs; and 8484A Maximum Input Power 200mW average or peak. DAMAGE LIMITS! either a HP 11730A or HP 8120-2263. 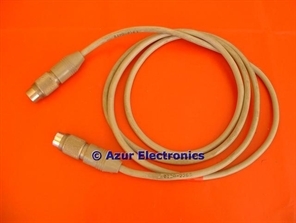 These use a special 8 pin plug at each end. NOTE: Peak power measurement is possible using the HP 8900B with a bandwidth of 50MHz to 2GHz. This needs a different power sensor using thermocouple or thermistor technology and a different cable. This is unlikely to be required by me. 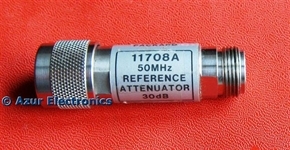 The HP 11708A 30dB Reference Attenuator is used with the HP 8484A so it can be connected directly to the Power Meters "Power Reference 1mW 50MHz Output to aid calibration. 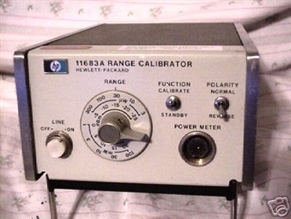 The HP 11683A Range Calibrator (Wanted To Buy) allows verification of full-scale meter readings on all ranges, as well as meter tracking. NOTE: These are all power meters for RF applications. Power can also be measured at mains frequencies with the Voltech PM1000 AC Power Analyser.